The 133 HP Deutz diesel engine increases productivity to trim more and pour more. Raising the operator’s platform and console further increased visibility of the auger and chute. Visibility was a favored feature of the original 5700 B. Operators were able to see what they were pouring without having to wait 10′ (3m) to see it or, have a crew member there to describe what was happening. Now, you have more visibility than ever before. A two-step extension was added for easy access to the operator’s platform for higher machine configurations. The redesigned console results in less motion for the operator. The work area is cooler, with hydraulic and engine coolant radiators relocated and mounted externally so that hot air circulates away from the operator’s platform. Filters for fuel, engine oil, air, and the high-pressure servo are located at eye level and in easy-to-reach positions-making service easier and faster. Servicing the radiator is easier since the radiator is mounted externally instead of being an integral part of the engine. Hydraulics are compact and centrally located at the correct height for easy servicing and less maintenance. The doors are removable. The battery pivots out for easy servicing. Rotary controls allow fractional changes in ground or conveyor speeds, resulting in a smooth, consistent curb. 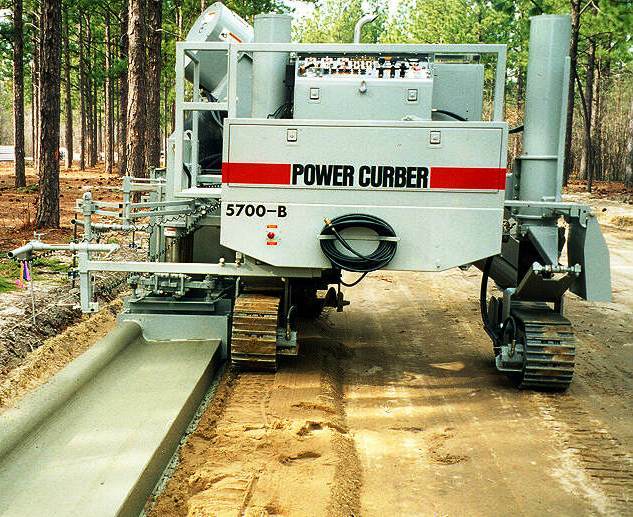 The auger conveyor moves concrete faster and mixes it better than a belt. Now, the advanced hydrostatic direct drive conveyor with high torque reduces maintenance. Crawlers have a heavier frame and increased torque for easier loading, pouring on inclines, or working in soft grade conditions. Increasing or decreasing tension on the crawler track chain is also easier with a hydraulic adjuster. The 5700-B was manufactured from 1994 through the end of 2003. Machine owners report that they were able to greatly increase their productivity with the 5700-B. As compared to the previous model, it has more weight and horsepower, taller lift posts, larger and heavier-duty crawlers, and increased speed. Users say things like they’ve “tripled a normal day’s production”, or that it has allowed them “to go from having 7 men behind the machine to 4 men”, and called the machine “very smart and very quick”. 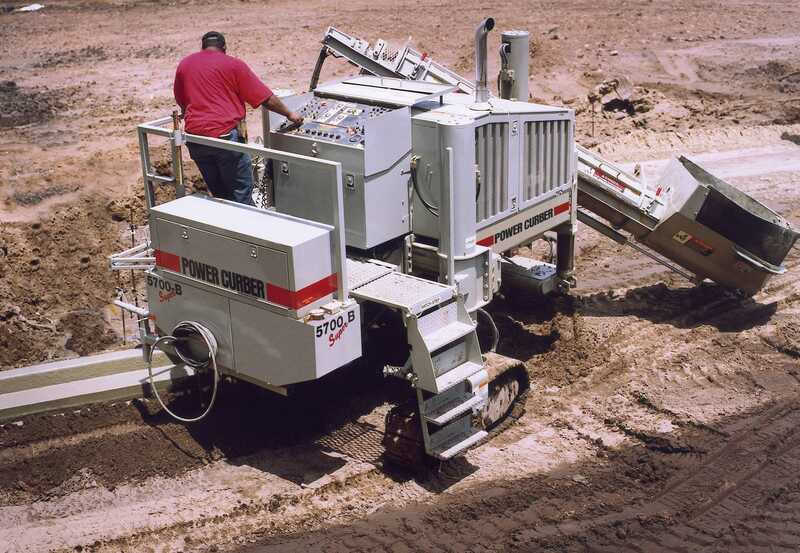 The 5700-B introduced the cast auger conveyor as a replacement to the conventional belt conveyor. It increased mixing power, sped up pouring, and eliminated many of the problems associated with belts. It pivots on its mount and hydraulically tilts and slides so you’re able to position it for many different job-site arrangements. At obstructions in the curb such as catch basins, hand tie-ins have been reduced from 10-15’ (3-4.5m) down to about 2’ (.6m), and you don’t have to come off the stringline. This increases your overall speed, production, and quality as well as reducing labor. It also provides flexibility for doing reconstruction work. Curb and Gutter, Tight Radius Work, Sidewalk up to 6’ (183cm) in the offset position, Monolithic curb, gutter, and sidewalk, Barrier/Parapet up to 48” (122cm) tall, Center Pour paving paths up to 8’ (2.5m) wide for golf carts, bicycles, or walking, Irrigation Ditches, Stadium Risers, etc. To a certain extent, the machine is only limited by your imagination. A very popular option, quick connect allows molds to be changed in a few minutes, and with very limited manual labor.